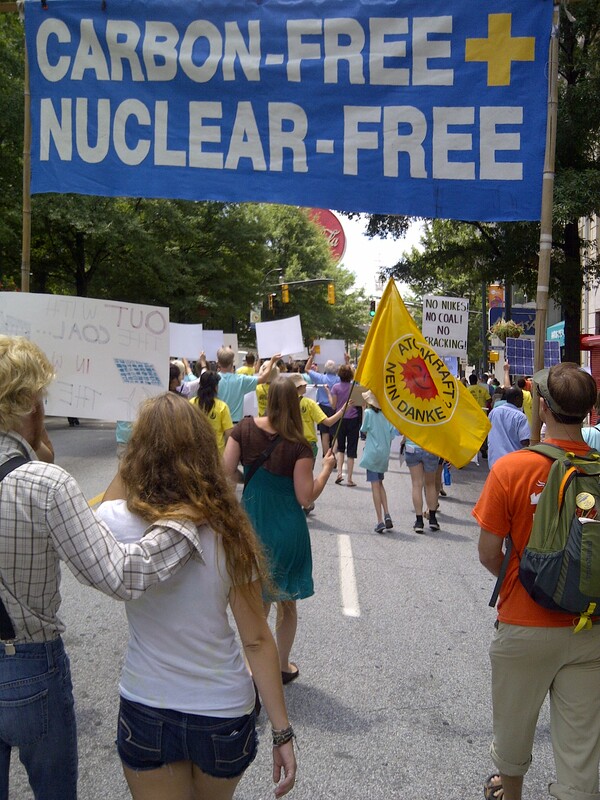 Nuclear-Free, Carbon-Free protestors at the July 29 EPA hearing on its Clean Power Plan in Atlanta. Here at NIRS we’re already in crazy mode organizing and mobilizing for the Nuclear-Free, Carbon-Free Contingent to the People’s Climate March in New York City on September 21, 2014. This is the largest public event organizing effort we’ve undertaken in quite a long time–and we think it will have a huge payoff by making a large, visible, vibrant public statement that that the climate crisis must be addressed now, that nuclear power is no solution to global warming, that a nuclear-free, carbon-free energy future is an absolute necessity for our nation and our planet. Today we released a statement of the Contingent, titled Why We’re Marching on September 21, 2014. You can read it below, and you can download a pdf copy for printing and distributing in your community here. At the kickoff People’s Climate March press conference in NYC last week. We also released a list of the initial, and fast-growing, organizational endorsers of the Contingent. This morning there were 38, at this writing there are 41. Endorsers include NIRS, of course, as well as Physicians for Social Responsibility, Musicians United for Safe Energy, and grassroots groups from around the country (and world). If your organization would like to endorse, send an e-mail with your name, organization name, city, state, and country (if outside the U.S.) to nirs@nirs.org. *To join grassroots planning/organizing calls for the Contingent, held every other Tuesday (next one is Tuesday, August 12, 2014) at 8 pm Eastern time, contact nirs@nirs.org. The climate crisis is the defining issue of our time. It poses an existential threat to life on Earth in a manner civilization never before has faced. Immediate action is necessary to slash climate-changing emissions in all sectors of society. 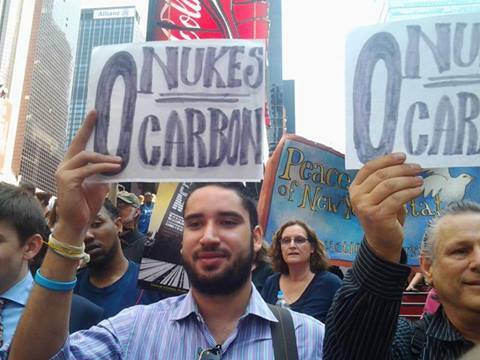 On September 21, 2014, the Nuclear-Free, Carbon-Free Contingent will join the historic People’s Climate March in New York City to demand immediate action from all of the governments of the world. The solutions to the climate crisis are not difficult to identify. A nuclear-free, carbon-free energy system is a necessity. It is an energy system that relies not on antiquated energy models of the 20th century and their polluting nuclear power and fossil fuel technologies, but on the safe, clean, affordable and sustainable renewable energy, energy efficiency, and modern grid technologies of the 21st century. Nuclear power in particular cannot solve the climate crisis. Indeed, its continued use exacerbates the problem by preventing the deployment of clean energy systems. *Too dangerous: expanded use of nuclear power would inevitably lead to more Fukushimas and Chernobyls. New reactor designs exist only on paper, have their own safety problems, and cannot be brought to the commercial marketplace in time to have a meaningful impact on climate change. The technology and materials needed to generate nuclear energy can be diverted to nuclear weapons programs. *Too dirty: nuclear reactors and the nuclear fuel chain produce vast amounts of lethal radioactive waste, which grow whenever nuclear power is used. The nuclear fuel chain is responsible for far more carbon emissions than renewable energy generation and improved energy efficiency. All reactors routinely emit toxic radiation–”the U.S. National Academy of Sciences has confirmed that there is no “safe” level of radiation exposure. *Too expensive: nuclear power is the costliest means possible of reducing carbon and methane emissions; its use crowds out investment in clean energy sources. *Too slow: use of nuclear power to reduce fossil fuel emissions would require an unprecedented nuclear construction program, beyond the capability of the world’s manufacturers within an acceptable time frame. Clean energy, including solar, wind, appropriately-sited geothermal, increased energy efficiency, distributed generation, electricity storage and other advanced technologies can meet the world’s electricity needs without radiation releases, carbon and methane emissions and other pollutants. All that is lacking is the political will to rapidly deploy these clean technologies. On September 21, we march to break the gridlock and demonstrate to the world that this will exists.